It is boiling hot in Athens. I cannot bear to be in the kitchen, at least not too far from the fridge where it is cool. So, no cooking. We have to make do with salads and fruit and cheese. Really, I have never asked you: Do you like mixing fruit and vegetables? Or are you strict purists? I do not like all combinations, my absolute worst is watermelon and feta cheese, which totally kills off the freshness of the watermelon. So, what is your favourite fruit and vegetable combination? (erm, wine and a green salad don't count). 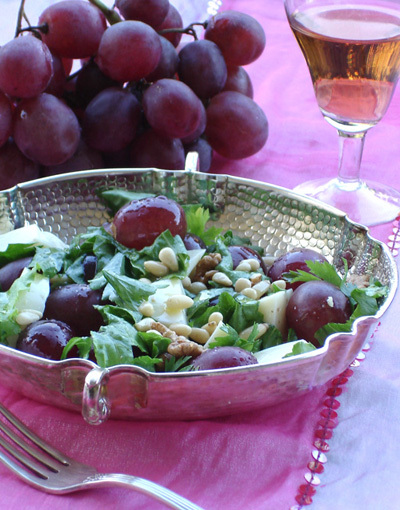 Toss walnuts and grapes with mixed salad greens or lettuce. Add pine nuts, parsley, and the cheese. Dress the salad with olive oil and lemon juice. Season to taste. Serve cold.